Joar is back on the trail heading for Iditarod to catch up with Ally Zirkle, and bypass Nick who has his 24 clock still going in Ophir. The Old Man of the Trail Martin Buser has made a guest cameo appearance, he ran straight through for Iditarod but still has his 24 hour break to take, so he will be well back again when he gets going. It still looks like a race between the Norwegian and the Frog, although Ally Zirkle is pushing hard and is within striking distance once everyone is running again. Coming up on the halfway mark now, and it gets serious. Both done with their 24 hour rest, the Frog & the Viking are now Neck & Neck on the trail to Iditarod. It doesn't get better than this. 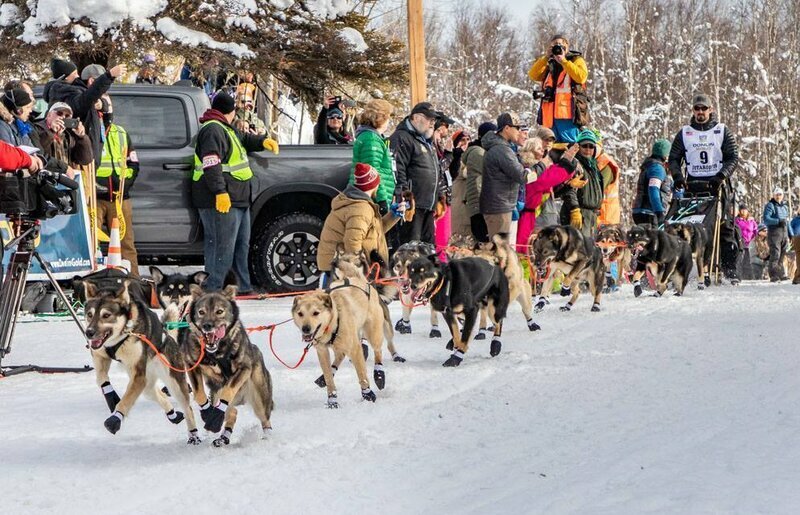 More than 400 miles into the race, and the two best Mushers and Dog Teams are Head to Head in the Battle for All the Marbles. If they are coming into Nome this close, the place will go wild like never before. I don't believe it has ever happened that the top spot was raced in a sprint at the end between two teams, it's just about always decided already by the last day. Nick and his Dogs are definitely the team to beat in this race. Those dogs are just AWESOME! They don't even look winded! Joar has his work cut out for him. Nick is now on a rest between checkpoints and Joar is on the move out of Iditarod, only 8 miles behind. Blowing through Iditarod may have been a mistake for Nick. 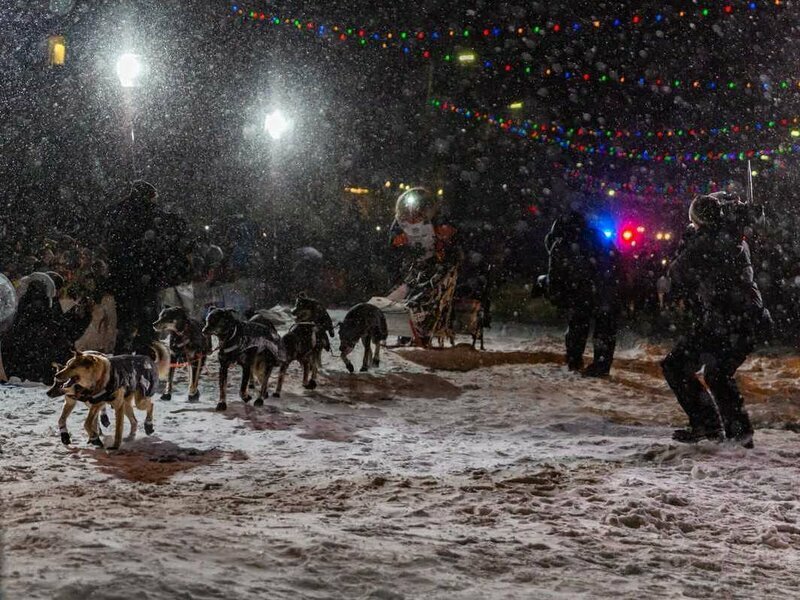 This is a REAL race between the best of the best in Mushing. It just can't get any better than this. I wish I could embed the vids I get as a Premium subscriber. I'm looking for vids that come up on Utoob as the race progresses. KTUU also puts up some that I can embed. Who do you put your money on, Joar or Nick? Even Odds. Currently all the mushers who have made it to Grayling are holed up there. Nick is on his 8 hour mandatory break, so he had to take the stop anyhow. Joar already took his 8 hours, so he could leave anytime. The question is, does he want to go out and get the jump on Nick? The problem with that is he would be breaking trail for Nick, and it's snowing there pretty heavily. Right now, he has really well rested dogs, but there has been attrition. Nick is down to 12 dogs, Joar is down to 11. Both started with the race limit this year of 14 dogs. The weather looks tough the rest of the way up the Yukon River and along the Bering Sea. It remains to be seen who can tough it out the best in the rough conditions. The race really begins now. 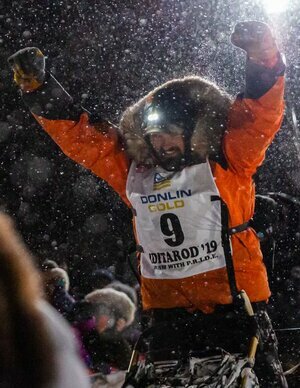 Iditarod 2019: Day 6 Begins! 3/8/2019 - The Viking is on the Move! Joar already took his 8 hours, so he could leave anytime. The question is, does he want to go out and get the jump on Nick? The problem with that is he would be breaking trail for Nick, and it's snowing there pretty heavily. No sooner asked than answered. Joar is on the move again! Nic still has at least 3 hours left on his 8 hour break I think, so Joar will have a nice lead. Snowing as it is, with that long an interval between Joar's tracks and his sled I'm not sure how much extra speed he might get from having the trail broken in front of him. Have to watch the leg times now to see who is moving faster up the trail. Nic will be playing catch-up, so he will need to move faster. Any mistake at this juncture can mean the difference between Winning and coming in 2nd, or even lower. Nic made a bad mistake inside 200 miles from the finish last year that cost him the race. Going off-TRail in a snowstorm is always a danger. Next stop: Eagle Island at mile 592. Major happenings on the trail here in the wee hours. A BORN & BRED LOCAL ALASKAN has stepped up to the plate to challenge the Viking & the Frog. We'll call him the Moose, real name Peter Kaiser. Bethel is totally out in the Bush. You can only get in or out of the place by Bush Plane. No roads. Population 6546. The Viking is in at Eagle Island, with the Moose just 3 miles back. The Frog is now in 3rd, 6 miles back. Remains to be seen how long any of them take in Eagle Island. If it remains true to form, the Flog will blow through and head for Kaltag. From there it's on to Unakleet and the Battle of the Bering Sea, where the mushers will be dueling tthe weather as well as each each other. This is shaping up to be the best Iditarod in years, since the days when Mitch Seavey & Susan Butcher battled it out. Here's the terrain they are crossing now to get to Nome, along the Bering Sea coast. Since recording this update, Nic has had problems and fell back. Bypassed by both Peter and Joar. This is a nailbiter! Video has a NEW musical Intro! 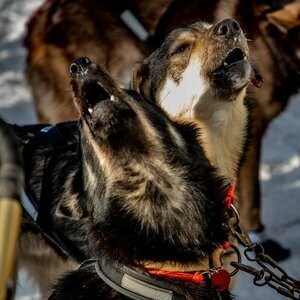  2019Iditarod:Day 8 3/11/2019 Begins! Day 8 begins with our 3 Leaders currently at the Rest Stop of Koyuk.. However, those leaders do NOT include Nic Petit, who is now well back and it's questionable whether he will actually be able to finish the race. I basically nailed this in an earlier Vidcast, where I said Nic was pushing his dogs too hard and they would burn out. So they did. On the way to Koyuk just about 30 miles out on the Sea Ice, Nic's Dogs quit on him. They were getting in fights and then Nic yelled at them and then they refused to run. They're not hurt, they're just over-tired and cranky. In an interview with the Iditarod Insider, Nic called it a "head problem". Like a Dog Psychologist could sove this problem There's a reason they have this head problem, which is Nic over-estimated just how much constant driving this team could take. Not coincidentally, this is the exact same area where Nic went off trail last year and then lost the race to Joar. His lead dog took the wrong turn and Nic didn't notice for around 7 miles then had to double back. I'll bet that lead dog was over-tired also. Far as the Mushers still in contention go, Peter the Moose is in 1st, Joar the Viking in 2nd around 1.5 hours behind and Jessie "Xena" is in 3rd around 4 hours behind that. The race to the finish line and the Reddington Trophy at this point appears to be down to the Moose and the Viking. They have a mandatory 8 hour rest stop to take at White Mountain and then the final push for Nome. It could end up a race to the wire with a sprint at the end. That would be amazing. The trials and Tribulations of Nic Petit, as they occured. Just a short Teaser Vid of the Victor crossing the Finish Line. For the full recap vid, you'll need to wait a bit. a lot of post production to do for this one. Cn you guess who won? Without watching the vid first of course. I didn't know Pete was half Yupiak. That really does make this HUGE for the Native population. No wonder they showed up in such large numbers at the Finish. If I had known that, I would have rooted for him more than the Viking. at the finish line of the Iditarod race. before the start of the Iditarod race.